Tsuyama"- Little Kyoto" SUBPAGE | All Japan Kyoto Association"
Since olden times, Tsuyama developed with its political center in Mimasaka, economic center in Izumo Kaido and transportation center along the Yoshii Canal. In 1603, a feudal lord, Tadamasa Mori, settled in this area, established his castle and developed a town around it. Today, the city roughly consists of two areas: Joto, on the eastern side of Tsuama Castle and Josai, on the western side. In the area where the old Izumo Kaido Highway used to run there were many accommodations which welcomed travelers visiting Izumo Taisha Shrine as well as massive samurai residences. The entire town is surrounded by trees with a canal running through and where a number of Buddhist temples and Shinto shrines are located. It is the city called “A Little Kyoto in Western Japan” which attracts visitors in every season. One of the most famous sakura cherry blossom viewing sites in western Japan. About 1,000 cherry trees will be in bloom at one time. The colored leaves in autumn can also be enjoyed by visitors. The second-generation castle master created this superb stroll-style garden with a large pond following the design of the Sento Imperial Palace in Kyoto. Every season is the best time to enjoy its beauty. As many as 22,000 specimens are exhibited in this museum all about plants, animals and fossils, some of which cannot be seen anywhere else in the world. In the History and Folk Museum, the life of merchants during the Edo period has been recreated. This is a treasure house of Japanese wisdom and wonder. The old Izumo Kaido Highway in Tsuyama was an important road connecting Edo (present-day Tokyo) and Izumo (present-day Shimane). The area along the highway prospered and still retains the old scenery and atmosphere of each period of time ranging from the late Edo period (1603-1868) to the early Showa period (1926-1989). There is the birth house of Genpo Mitsukuri (a scholar of Western study) and Tsuyama Western Study Museum where historical materials related to Genzui Udagawa, a scholar from Tsuyama are exhibited. After the large political battle from 1331 to 1333, Emperor Godaigo was exiled to an isolated island in Oki (present-day Shimane Prefecture). An old legend in the Taiheiki says that a samurai lord, Takanori Kojima, created a poem in order to console the heart of Emperor Godaigo. This shrine is believed to be where Kojima composed the poem. About 1,000 cherry trees reach their full bloom. The fallen petals on the stone walls tell of spring’s end. Night-time cherry blossom viewing is also recommended. Along the Yoshii River Bank Park, fireworks, Gongo dance, and night festivals will be presented. One of the three biggest Mikoshi festivals in Japan. Large Mikoshi portable shrine and the Danjiri floats will parade around the city. Many food stalls and shops will be opened in the Edo-period town. Kasuri is a traditional splashed pattern kimono made of cotton and is a traditional industry of Sakushu Tsuyama. Many households possessed a loom to weave Sakushu Tsumugi textile. After the yarns are dyed, they are woven in accordance with the design only with deep indigo and white colors. All handmade Sakushu Tsumugi is a traditional craft of Okayama Prefecture. Generally, Yokono Washi is placed in between extremely thin and delicate gold or silver leaves in order to separate them one by one. The tradition of Yokono Washi was already flourishing around 1804-1818 and was highly recognized and cherished by the samurai governor who ruled over the region. The extreme thinness, durability and soft touch are all examples of highest quality work. It is designated as the traditional craft of Okayama Prefecture. Handmade bamboo craftwork which represents cattle grown in the mountain areas of Chugoku region. In 1985, this Sakushu Cow craft was selected for the special New Year postcard design. Popular sweets which uses fragrant yuzu (Japanese citrus) from the Mimasaka area of Tsuyama. Sweet red bean jam sandwiched between fluffy castella (sponge cake). A sweet dumpling of a soft rice cake with a silky red bean jam interior, with the rice cake sandwiched by sticky Kyoto-fu (flour gluten cake). A traditional sweet of the Mimasaka area of Tsuyama. Sticky rice grown in Tsuyama and a small amount of sugar are the two major ingredients. A sweet dumpling of a soft rice cake wrapped around a silky red bean jam. 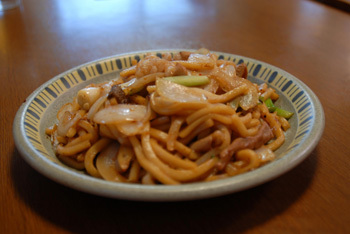 Many Yakiniku (Japanese beef barbeque restaurant) and Teppanyaki restaurant in Tsuyama serve udon noodles with beef Horumon (cooked innards). Eight cake shops in the city present original roll cakes. 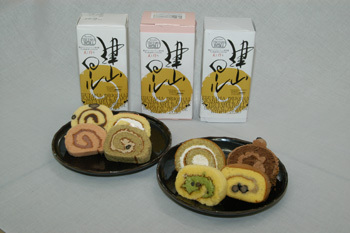 The cake is made with flour from Tsuyama and various other local specialties.